If teaching a group that needs GPS, I have a small case that can be included that contains 6-7 different types of GPS devices. 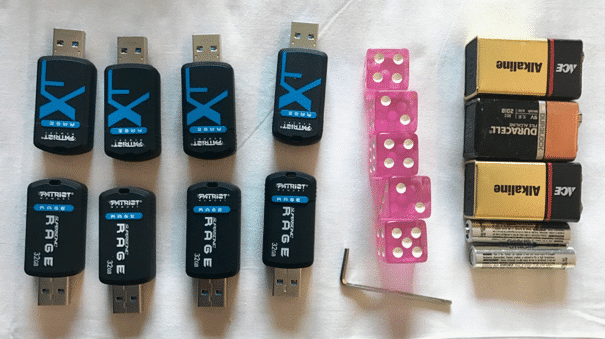 USB-based, Bluetooth, Stand-Alone, and Compasses to teach to/from bearings. But I didn’t happen to have the GPS bag with me on this trip. These parts together fit nicely in my latest traveling case, a G-RO I got from Kickstarter. It also has a big battery, and GPS for tracking the bag itself. 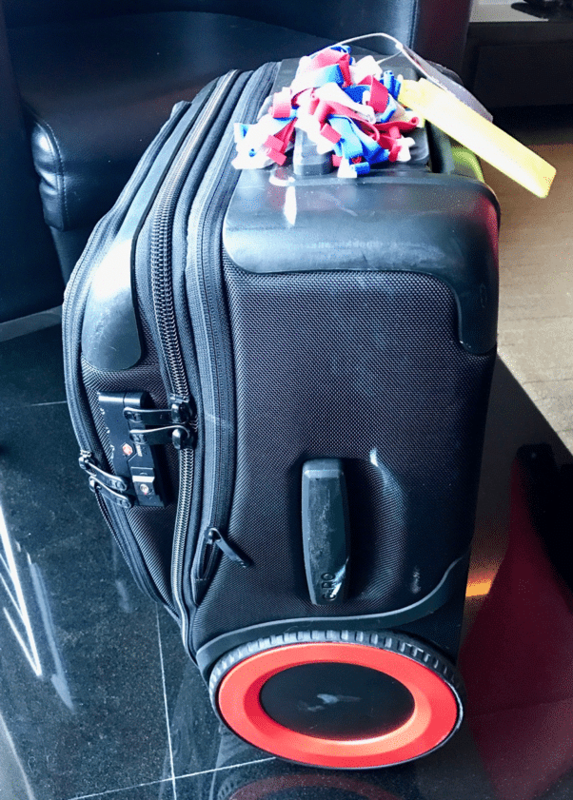 The large wheels make it easy to maneuver, and it is right-sized to fit as a carry-on with Airlines – but I normally ship this in the baggage hold. First, let’s see all the item sets. Each of these sets goes into a sub-bag, and all the sub-bags fit into some MOLLE-wrapped AR-15 ammo carrier bags. Thus, items are in one bag, nested into another, and finally in a hard-sided luggage. I’ve not found any issues with breakage. This is much lighter and easier to move around compared with my previous Pelican cases. I’ve switched to MacBook 12” laptops for teaching and a MacBookPro 13” for my personal laptop. Both of which travel with me everywhere. 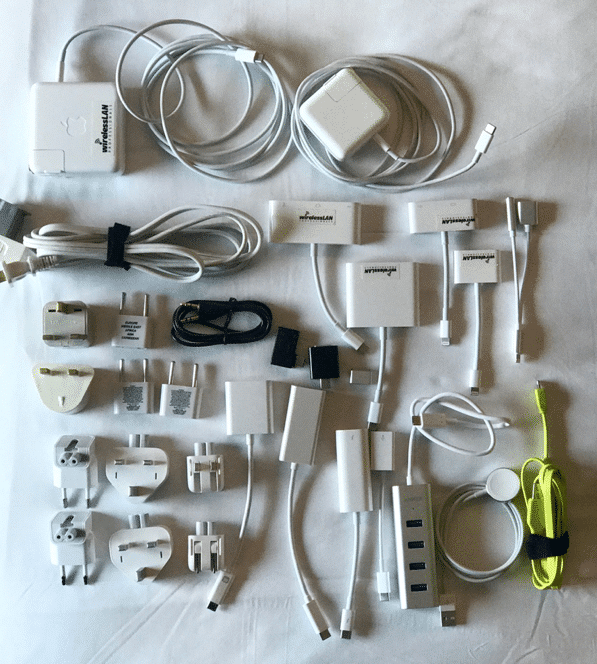 First the power adapters for the two laptops – this set of power/cables/adapters goes in the instructor kit, another matching set goes in my backpack for use in hotel room, or as a spare/backup. 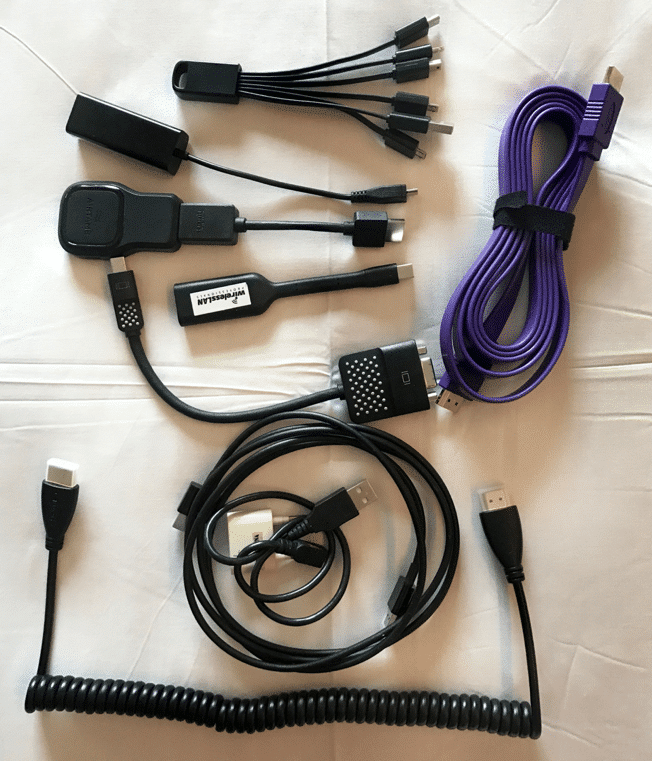 Dongles from USB-C to VGA, to HDMI, to Ethernet, to big Display port and mini display port as well as Lightning to HDMI and Lightning to VGA. (I use an iPad Pro 9.7” with an Apple Pencil as a replacement for a Whiteboard in many situations) The iPad and the MacBookPro 13” stay with my backpack – so even if I’m separated from my Instructor kit I’ll be able to do most things necessary in teaching. This kit is for teaching concepts and doing demonstrations of Spectrum Analysis. The main ‘professional USB case’ stays with my backpack – but this set of demo gear is with the Instructor Kit. This kit has a variety of items to cause RF interference to demo in class. This kit stays in my backpack, and is the one I use for most consulting gigs to troubleshoot Wireless LANs. But it also does double-duty as the main kit I use whild doing Spectrum Analysis demos in class. 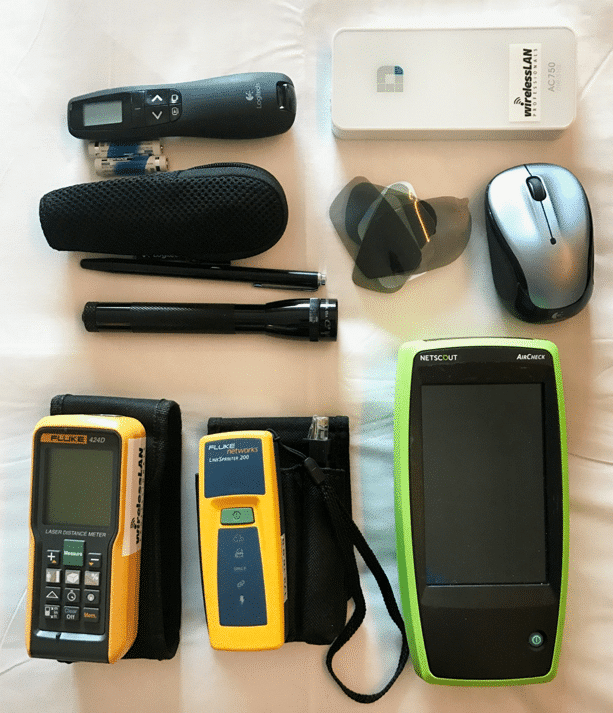 This has sets of gear for doing just about everything I need in a troubleshooting and/or validation survey situation. 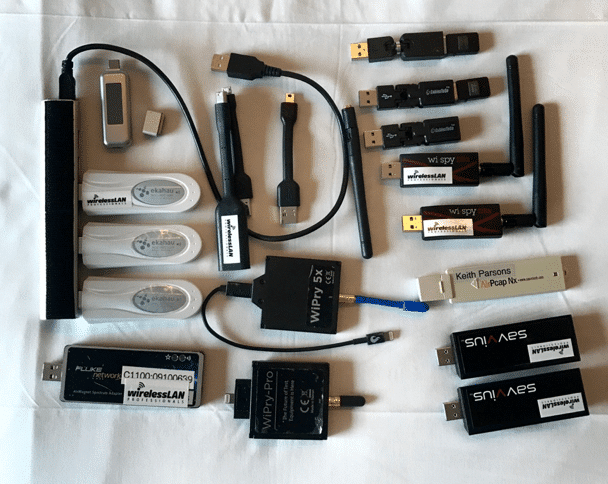 All of this fits in a single USB Case from #WLPC. 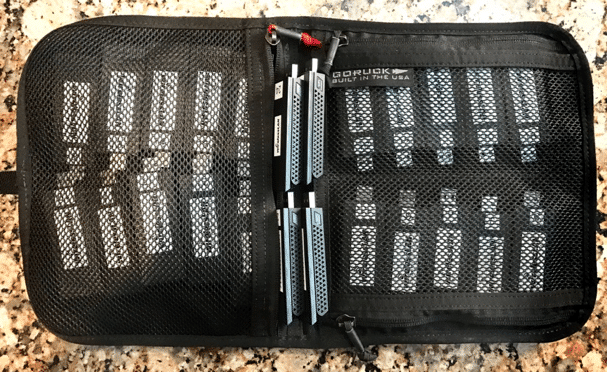 This small bag contains a set of Proxim 8494 NICs for use by students in class. 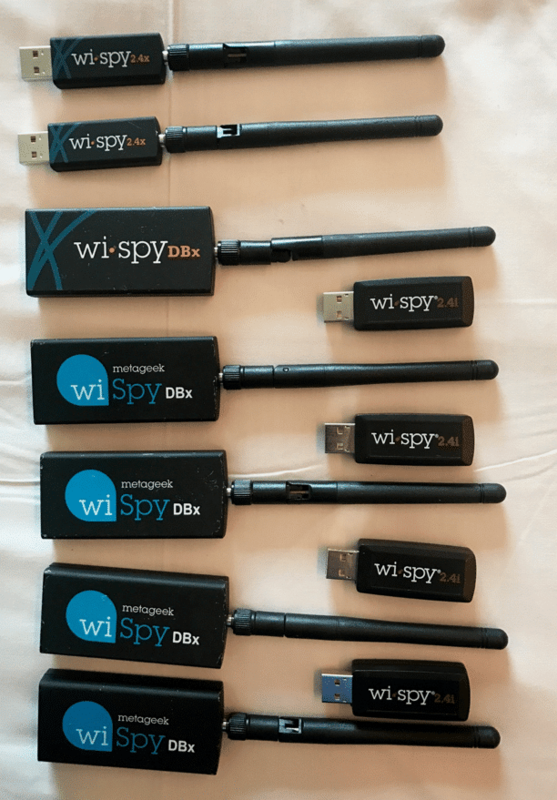 This set of 24 NICs are for use when teaching CWAP or packet analysis courses and work well with OmniPeek for students to use doing hands-on exercises. This set of Metageek Spectrum Analyzers are for use of students during the Spectrum Analysis demos. 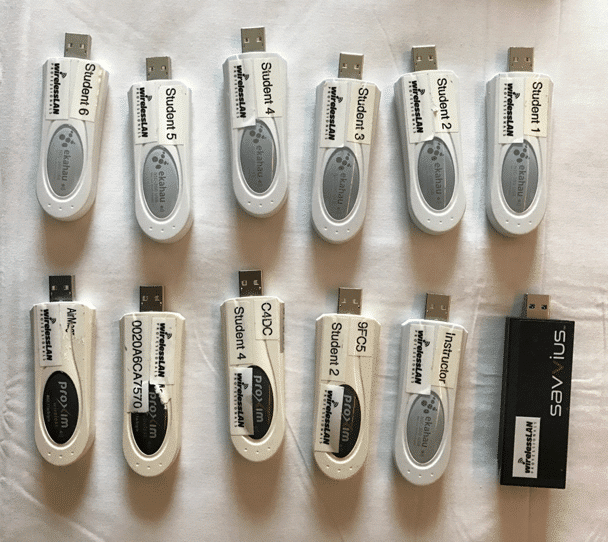 Not all classes have the time to setup these – but when students want to experience the RF interferers for themselves, these are ready to help. 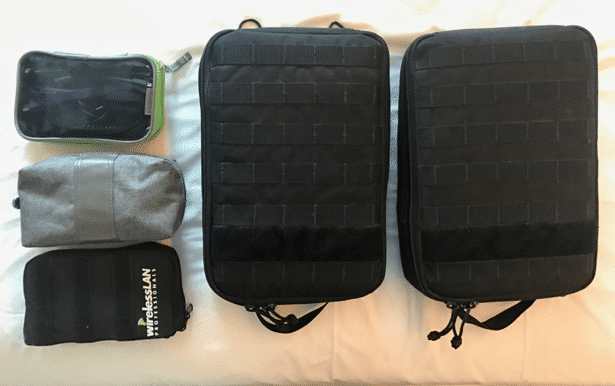 This set of items fits in one of the larger MOLLE bags. 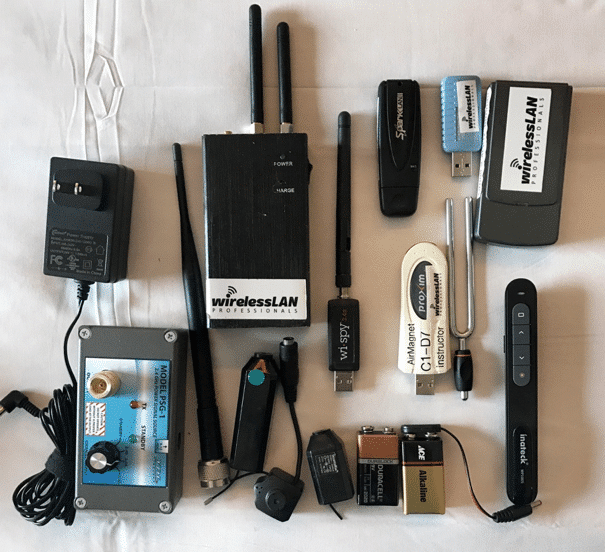 This contains the items I use as an instructor to teach Antenna Polarization, how to measure RF attenuation in walls, quick WLAN troubleshooting, and laser pointers, spare mouse, and spare batteries. I also rely on this kit when doing live customer troubleshooting, validation, or design work. This smaller bag has dice for teaching about contention processes, spare batteries, and student USB’s to pass around in class to share course files. This bag is a backup. Multiple extra HDMI cables, adapters, and an AirTame to stream directly to an HDMI projector or HDMI screen. 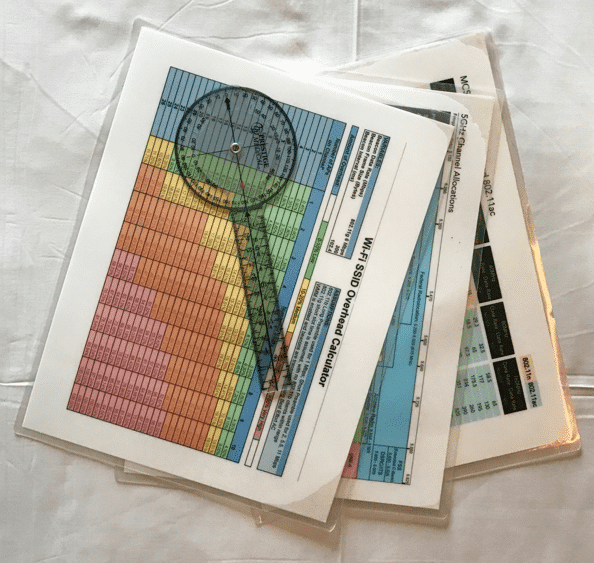 I use these cards ALL THE TIME… thus they are laminated and in the instructor kit. I also have printouts of all the student exercises to hand out in class that are re-stocked after every trip. The Goniometer is helpful for teaching about directional antennas and how to properly use them. This is a backup for doing presentations, and runs all my Windows-based professional WLAN tools. It can be booted into Mac OS if needed. But the default on this is Windows. 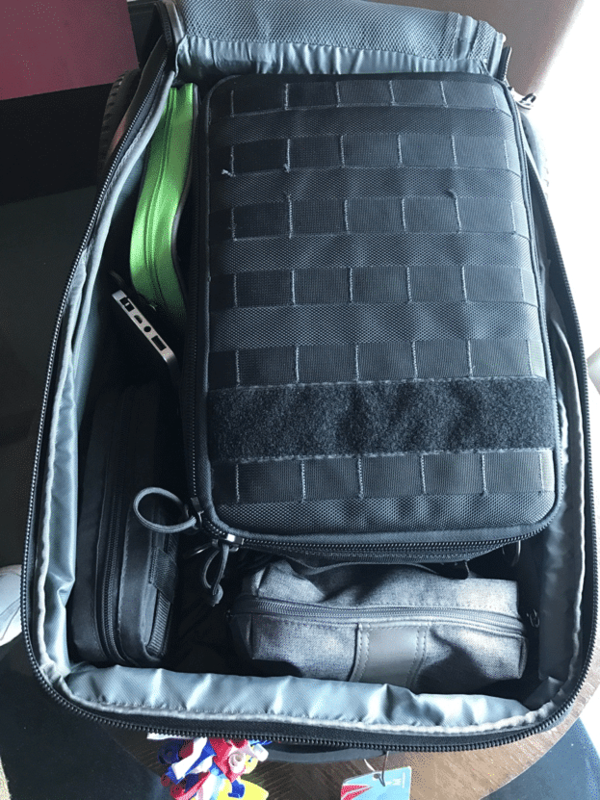 As mentioned earlier – all the previous sets of items fit into smaller bags, and these are organized into the larger MOLLE cases. These are configured with one bag being for teaching Days 1-2, and the other for Days 3-4 in the Designing Wireless LANs course for Ekahau. Some of the other smaller bags are used for non-daily redundancy. These cases are then placed inside a traveling case – designed to be right-sized to meet airline carry-on restrictions. I’m currently using a G-RO case from Kickstarter as the carry-on case of choice. But in the past I’ve used cases from LowePro and Eagle Creek without any issues. There you have it. 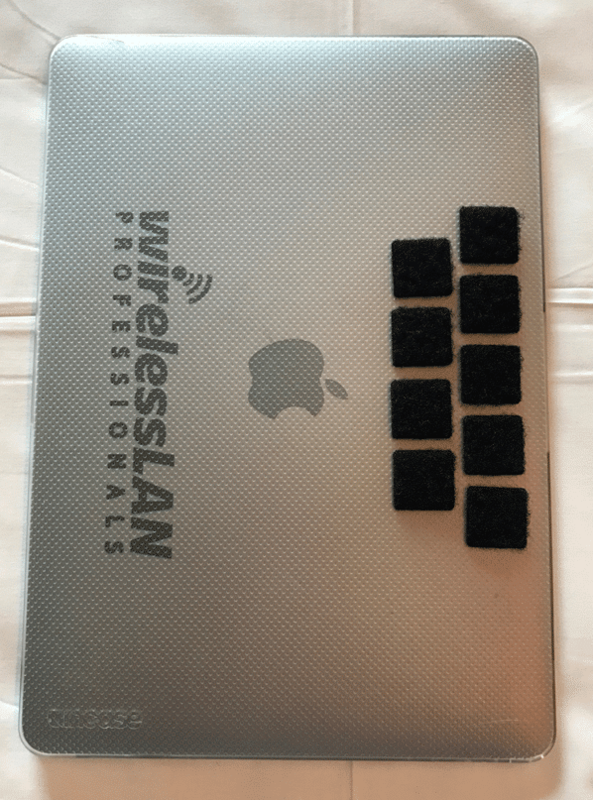 The items and organization I use for carrying gear to teach a wide variety of Wireless LAN courses. If you have any ideas or suggestions on what else I might need to carry, and/or how to better organize these items – please email me at [email protected].